Monetary prizes of $100 for projects that were not prizewinners but have the potential to develop into top-level projects. Sebel Testing and Evaluation Awards three K-12 students who incorporate the most extensive testing or evaluation routine in their investigation or innovation (still to be confirmed). 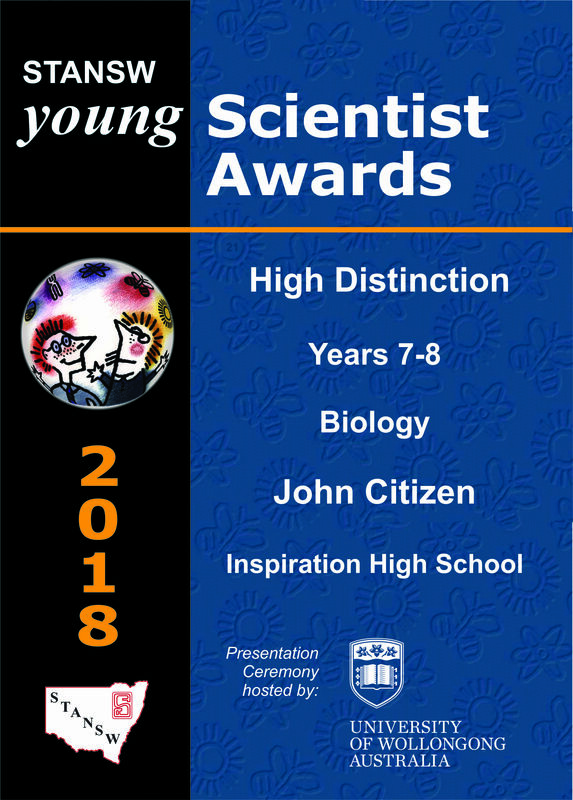 Primary Environment Award – for the project that best addresses a significant environmental issue or adds to our understanding of the natural environment. High Distinction Certificate for every student who achieves a level 5 against the rubric. Distinction Certificate for every student who achieves a level 4 against the rubric. Credit Certificate for every student who achieves a level 3 against the rubric. Most prizewinners and a selected number of highly commended entries will be invited to submit their entries into the national 2020 BHP Billiton Science and Engineering Awards. Twenty-six finalists (high school only) will be selected to attend an all-expenses paid trip to attend a five day science camp in Melbourne, in February 2020. Thanks go to our supporters for providing encouragement to students, teachers and schools and for making these prizes possible.